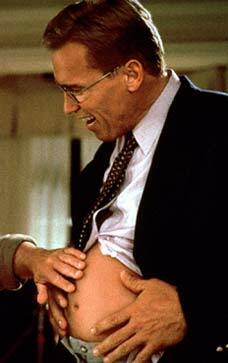 Junior is a movie in which Dr. Alex Hesse (Arnold Schwarzenegger) is carrying a baby. Danny DeVito and Emma Thompson also take part in this travesty. In the At The Movies review Roger tells us how good of a comedic actor Arnold is and agrees with Gene that the movie will be "cascadingly popular." I don't think those are the words that I would use to describe this, almost unwatchable movie. 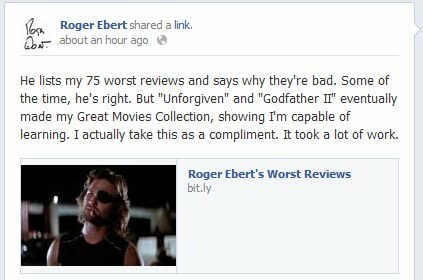 In his written 3 and a half star review Roger said "The most unexpected thing about the movie is not that it's funny, which we expect, but that it's sweet. It's one of those films you sit through with an almost continual smile. It's goofy and ridiculous and preposterous, and yet it makes you feel good, and there is something oddly heartwarming about the sight of this macho guy melting with feelings of protectiveness and maternal concern." I agree it's goofy and ridiculous and preposterous but it didn't make me feel good. I also didn't smile too much. It has a 4.4 rating on IMDB and a 34% rating on Rotten Tomatoes.